The Kia Sportage has received a 2018 freshen up, the external changes are limited to a new front bumper and a revised rear with a full-width light bar and the internal changes are limited to a new, frameless 8-inch screen on the upper trim models. The major change is the addiction of a mild hybrid option to the range, and we mean mild, a battery under the floor that that stores energy and uses it to assist the engine during moderate acceleration. You do get a Hybrid badge but the downside the engine it’s attached to is one of those dreadful polluting diesel types. 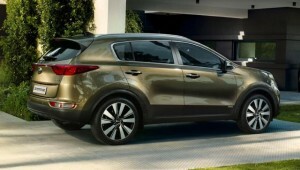 The Sportage remains Kia’s best selling model, accounting for 40% of sales but competition is tough and comes in the form of the Kia’s sister car the Hyundai Tucson the Nissan Qashqai, which is the top selling small SUV, the sporty Ford Kuga and the best value Renault Kadjar. The new Sportage is a comfortable and reassuring drive and has a good amount of kerb appeal, it’s a car that is difficult not to like without ever becoming over excited. 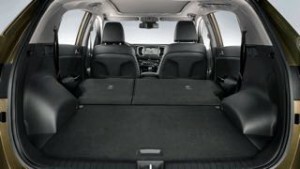 There’s plenty of space inside while all the materials used are of a good quality but if its a flash dash you are after you need to go French, the Peugeot 3008 to be precise. The driving position is good for driver and passengers alike, in the rear you can fit three people comfortably – even though the middle seat passenger has to position their feet either side of the transmission tunnel. There’s excellent knee room and decent headroom despite the sloping roof-line. The Sportage has a good shape boot, the load lip is low and flat and at 491 litres, the Sportage boot is comfortably larger than that of the Ford Kuga and Nissan Qashqai. 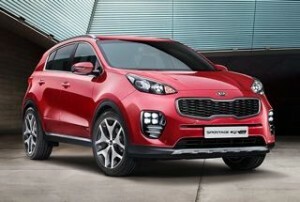 The Kia Sportage range is now 1, 2, Edition 25, 4, and GT Line trims. Entry level ‘1’ trim cars come with 16-inch alloys, LED daytime running lights, air-con, DAB radio, cruise control, air conditioning, 7 inch touchscreen, reversing camera, Apple CarPlay/Android Auto and a number of driver safety systems including Trailer Stability Assist, Hill-Start Assist Control, Downhill Brake Control. ‘2’ cars add a sat nav, 17 inch alloys, heated front seats, dual-zone climate control, automatic wipers, privacy glass, Lane-Keep Assist, High-Beam Assist, and a Speed Limit Information Function. Edition 25 trim is like a ‘3’ trim line, LED rear lights, mix of leather and cloth seats, electric in the front, heated steering wheel, keyless entry and the upgraded 8 inch screen, ‘4’ trim adds a panoramic glass roof, 19 inch alloy wheels LED headlights and full leather. The GT line has 19 inch sports alloy’s, ice cube LED’s and red stitching to the leather seats, the GT Line S adds a power tailgate, 8 inch touchscreen, wireless phone charging, ventilated front seats, smart cruise control and electric front seats. The revamped engine line-up sees the 1.6 litre petrol receive a few tweaks to help pass the emission targets but the performance is the same, the naturally aspirated puts out 130bhp and the turbocharged version 174bhp, only really of use to low mileage customers or those that need the option of a 4 wheel drive car as the fuel economy is 39.8 mpg and 36.2 for the 4wd 174bhp car. The old 1.7 litre diesel is replaced with a cleaner and quieter 1.6 that has 114bhp of power in ‘1’ trim but move up to trim ‘2’. and you can choose the better 134bhp unit that can be paired to the seven speed dual clutch automatic gearbox, economy is an excellent 57.6 miles per gallon. The Mild Hybrid is paired to a 2.0 litre 8 speed automatic and sees a 48-volt lithium-ion battery added to the car that pushes you along a little, the system recovers kinetic energy during deceleration phases and provides torque assistance when accelerating. We are not big fans of mild hybrids as a rule but if you have deep pockets it’s probably the best choice. Prices for Q2 have either increased by £100 or stayed the same.